Vida Network VCRM provides the tools and features to enable you to customize our VCRM solution to meet the needs of your business. In cases where you need new functionality to be added, the Vida Network team provides customization services to meet your needs. 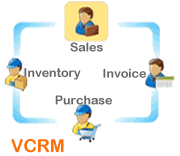 Vida Network VCRM software is available as a Hosted solution from us as well as a purchased/premise solution installed at your business on your computers. Either way getting up and running is very straightforward as all the necessary software is integrated. Vida Network understands every business is different so we allow you to customize Vida Network VCRM to your business processes or we’ll be happy to do the customization for you. The choice is yours!